Stephanie Law's work is an exploration of mythology mixed with her personal symbolism. Her art journeys through surreal otherworlds, populated by dreamlike figures, masked creatures, and winged shadows. The fantastical permeates through the visions with a promise that this is a world that underlies reality, when viewed with a desire for beauty and a shifted perception. Growing up in California, Stephanie has been surrounded by the wealth of natural inspiration all around her. The twisting boughs of live oaks from the hills near her home insinuate themselves into her paintings. The chaos of Nature's wild growth, and conversely the beauty of decay, echo in the textures and fractal patterns of her work. She began her illustration career working with many fantasy gaming companies. Early on, she did pieces for Wizards of the Coast in Magic: the Gathering and Forgotten Realms, as well as with Skotos Tech (Castle Marrach), White Wolf (Changeling), Alderac Entertainment (Legend of Five Rings), and Green Ronin (Blue Rose). She also worked with publishing companies LUNA Books, Tachyon Books, Palazzo Editions, Llewellyn Worldwide, and f+w Publishing. In 2004, she embarked on a more personal long term project of what eventually was released in 2009 as The Shadowscapes Tarot, by Llewllyn Publishing. The tarot was an ideal melding of her fantasy experience with her desire for exploring archetypes and mythology. Since then, she has worked with Llewellyn Publishing on other projects, including calendars and an herbal guide. She currently has a new deck in the works, called the Dreamdance Oracle. 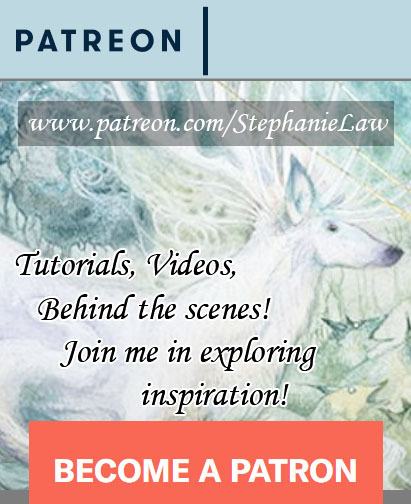 She is also known for her series of watercolor technique books, "Dreamscapes", published through Impact Books, showing anyone how to pick up pencil and brush and embark on their own explorations into painting fantastic worlds and the creatures that inhabit them. When not painting into the twilight hours, she can be found dancing, playing on her handpan or piano, and introducing her daughter to the hidden beauties of the world. Succulent Dragons, Shadowscapes Press, 2018. Descants & Cadences, Shadowscapes Press, 2016. The Herb Gardener's Essential Guide (plant illustrations), by Sandra Kynes, Llewellyn Worldwide, 2016. Dreamscapes: Fantasy Worlds, North Light Books, 2014. Dreamscapes: Magical Menagerie, North Light Books, 2012. Dreamscapes: Myth & Magic, North Light Books, 2010. The Shadowscapes Tarot, Llewellyn Worldwide, 2009. Dreamscapes: Creating Magical Angel, Faery & Mermaid Worlds, North Light Books, 2008. Spectrum 24, Flesk Publications, 2017. Spectrum 23, Flesk Publications, 2016. Spectrum 22, Flesk Publications, 2015. Spectrum 21, Flesk Publications, 2014. Spectrum 20, Flesk Publications, 2013.